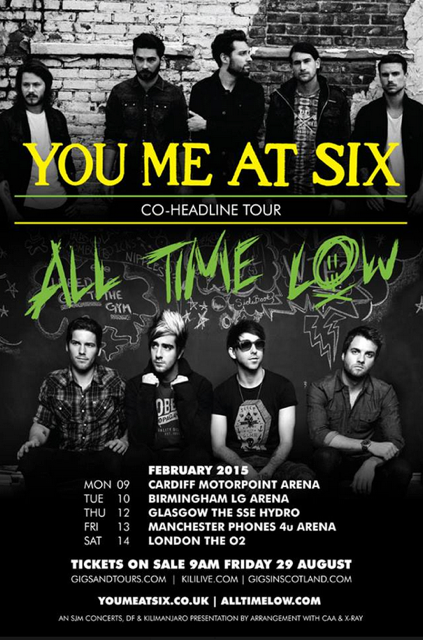 English rock favourites You Me At Six are teaming up with American pop punk mega stars All Time Low for a co-headlining UK arena tour later this year. The two rock giants will play 5 UK venues in February, starting in Cardiff on the 9th and ending at London’s O2 Arena on the 14th, with the Birmingham show slotted in between on the 10th, at the newly named Genting Arena. Meaning it’s exactly one month away! This tour is highly anticipated as one of the most exciting tours of 2015 and tickets are on sale NOW, from most reputable ticket sellers!